Experience the art, style and skill of one of the UKs finest performers / entertainers (even if I do say so myself)! I can be hired to perform either on stage for an audience to watch and marvel or as a walkabout performer getting in amongst the crowd and giving a more personalised feel to your event. 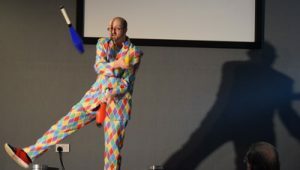 Shows can last anywhere from 3mins to 45mins (Christian Juggling up to 90mins with a 15min interval) and can be repeated throughout the day or pick n mixed with a wide variety of my other Juggling services such as Circus Skills Workshops and Walkabout entertainment to create extra added value to your event. Here is a list of some of the props you may see during your show. Please note that I am constantly learning new skills and new routines can be specially written for your event to fit in with particular themes you or requirements you may have, and in fact some of my best routines have came about when I have had to work to certain requests so I look forward to considering all enquiries! Performing to Music, especially mashups of recent chart hits that I have created! Throughout the shows, there is lots of Comedy, Magic, Music and Audience Participation! I can supply my own Sound System and equipment for the performance (I need access to an electric plug socket for my hands-free radio mic if required), so all you need to do is point me to the performance area and let me take care of everything else! This is good clean fun and completely tailored for your event to suit your particular audience. 30min Schools Show – This show can be specifically tailored for just one age range, or for the entire school. If you would like the show tied in with a particular theme such as friendship, healthy living etc then the show can include these positive messages (just ask)! More info on the 30min Schools Show here. 5 Different shows currently available, and happy to consider requests for routines/themes/messages you would like performed! Walkabout Entertainment – A slightly different kind of entertainment more akin to the Wandering Minstrel! This particular skill is useful for your event where you want to create a buzz or a bit of an atmosphere. 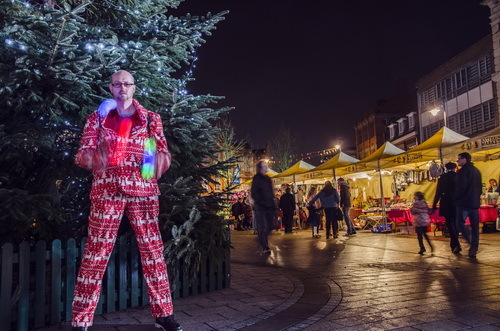 I simply wander amongst the crowds at your event and stop to entertain small crowds and individuals at random. Particularly useful for events where there are long queues as I can keep these people entertained while they wait (eg Music Festivals, Store Openings, Funfairs, Santa’s Grotto)! Find out more about walkabout entertainment. Brilliant for Christmas Light Switch-on’s and Funfairs and Festivals! 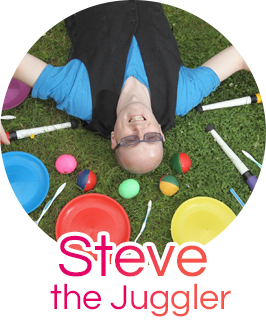 Show as part of Circus Skills Workshop and/or Parties – If you intend on hiring me to run a Circus Skills Workshop at your event, it could be finished with my own show, or even a talent show put on by the participants themselves with some expert training from myself! A great chance for the participants to immediately put into practice what they have just learned. The show can be targetted at a very specific age range if required (so that they enjoy it the most), and is good clean entertainment that everyone will enjoy! Christian Juggling – I am a Christian and can perform a Gospel Juggling show for up to 90mins (inc 15min interval) at your event. This particular God given skill is particularly effective at Church Outreaches or even during the Sunday Service as the Children’s Address, although Adults will get just as much out of it! 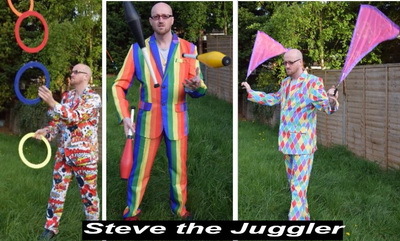 Much more information is on my Christian Juggling page. Fire and Glow Juggling – Great to use indoors (glow) or outdoors (fire/glow) to make your night-time event even more memorable, especially as a warm-up (pardon the pun) for a special occasion such as the Fireworks Display or CHRISTmas light switch on, or as a fantastic way to end your Circus Skills Workshop or Birthday Party! 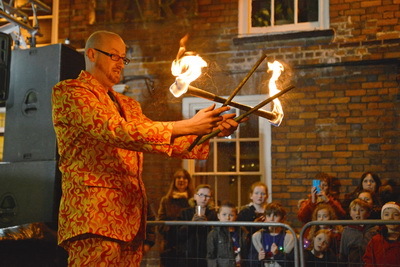 Find out more about my Fire and/or Glow Performances. Weddings – Hiring Steve to perform at the entrance to the main event as a meet and greet alongside any Ushers, or during the Wedding Reception to keep the kids occupied while the meals and/or speeches are taking place can take some of the stress out of your BIG occasion! If you would like me to wear my full kilt outfit (as I am a Scotsman) then I can do this also. Visit the Parties/Birthdays/Weddings page for more ideas!